Pile thickness is one of the factors that are often used when selecting oriental rugs. The first thing you should know is that the thickness of the pile is not an indication of the quality of the rug. Oriental rugs with thicker piles are not necessarily of higher or lower quality than rugs with thinner piles. The only difference it makes is in the way the rug looks. Rugs with thicker piles have a dense, lush and luxuriant look, while rugs with thinner piles look more delicate and elegant. To make it easier for you, we’ve grouped together Oriental rugs into two different categories depending on their pile thickness. In most cases, the thickness of the pile is determined by the type of wool used and the knot count of the rug. Rugs with thicker piles have a dense, lush look, while rugs with thinner piles look more delicate. Heriz – Heriz rugs have a loosely knotted, wool pile on a thick, sturdy cotton foundation. Coarsely constructed with a knot count that ranges from 30 to 100 kpsi, these rugs are famed for their durable and hard wearing qualities. Kashmar – Kashmar rugs are interestingly constructed. These rugs typically have delicate patterns intricately woven with a tight but thick pile. Mashad – These rugs are known for having the best quality wool pile. The pile is tight and thick and woven over a cotton foundation. Hamadan – Hamadan rugs are single-wefted rugs. They have a thick pile that is made of high quality cool coarsely woven over a cotton foundation. Kazak – After the weaving is completed, the pile of these rugs is cut very short so they resemble antique rugs. Bokhara – When knotting Bokhara rugs, weavers use one thin weft that is passed through the rug horizontally. This weaving technique results in a rug with a thinner pile. Peshawar – The pile of Peshawar rugs is cut very short after the weaving is completed so that they look like antique rugs. Kilim – Kilim rugs are unusual in that they have a completely flat weave, so there is no pile at all. These are the thinnest of all rug types. Very old rugs – The pile in very old rugs is naturally thinner because of the wear and tear over the years. 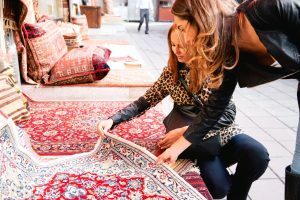 As long as the rug is in good condition, this will not affect the value of the rug. Rugs with silk foundation – Silk is a thinner and more delicate fabric as compared to the thicker and more robust nature of cotton. Rugs that are woven over a silk foundation would naturally have a thinner and more delicate pile. Rugs with a cotton foundation and silk and wool pile – A silk and wool pile is thinner and more delicate than an all-wool pile. When constructed over a cotton foundation, the combined silk and wool will have a lower pile thickness and a more refined and elegant look. Should You Choose A Rug With A Thicker Or Thinner Pile? When it comes to choosing oriental rugs, the right pile length ultimately depends on the look you are aiming to achieve.